Other than checking in with familiar faces at open practice on Saturday afternoon, fans got their first glimpse of some summer acquisitions along with the coaching staff. Hornqvist was sought after by the Penguins for his straight up style of play and his habit of going straight to the net. He made a point to show off both of those skills to the fans of his new team. Frequently carrying the puck in on drills, he would often pass to the opposite forward and not lose stride before waiting for a pass in the paint. No fear of getting on the goaltender’s nerves either. Perfect. 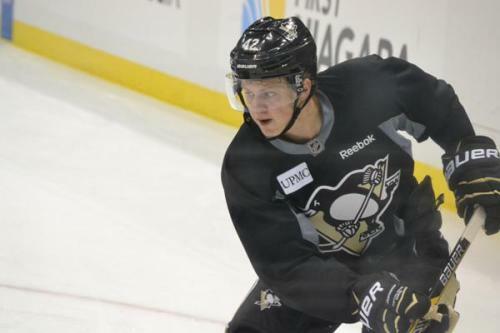 Hornqvist will fill a much needed spot playing on a line with Evgeni Malkin. Though Malkin still hasn’t seen any action at camp, there should be no doubt that the two will be able to adapt quickly. Gone are the days of Malkin and Neal setting up for a play like the Harlem Globetrotters and only retreating with one scoring chance to their name. Quick chances off of one play are in the cards for whoever plays with Hornqvist. No need to mourn the departure of Matt Niskanen. Flying under the radar after spending three years with the Buffalo Sabres, Ehrhoff got the chance to show Pittsburgh what he’s all about. Ehrhoff is known for his wrist shot. Pull up almost any goal from his highlight real and it becomes very apparent very quickly. We’re not talking about a wrist shot from the slot or just outside the dots. We’re talking about powerhouse from the point. Fans should be very excited when (not if) Ehrhoff gets time on the power play. Any combination of his wrist shot and traffic in front of the net should net the Penguins a goal. Don’t be surprised if Hornqvist and Ehrhoff get power play time together while they let the other unit make the fancy plays. While he’s no Kris Letang, Ehrhoff’s skating is solid along with his reach. There is no need to question his defensive ability either. The best of Paul Martin and Matt Niskanen will shine in Christian Ehrhoff. Imagine that. Remember the uproar? Forget it. Steve Downie was signed to make this team tougher – “add some sandpaper” if you will. He has more than that. Steve Downie has moves. Without a doubt, the gritty and sometimes questionable Downie is still there, but that’s not the side he chose to put on display for the crowd. They got a dose of “Spin-o-rama” Steve Downie. That may not have existed until now, but it would be fitting (except in a shootout). Rick Tocchet is already showing signs of being able to control this “loose cannon.” Downie took the ice with an offensive mindset and didn’t let up. If the line of 19-16-23 holds true through the season, the third line will be one to compete with. If Downie can clear a path and work with Brandon Sutter on offense, the Penguins may once again have one of the best third lines in hockey. Nick Spaling made headlines after opting for an arbitration hearing. That’s about the most Pittsburgh has “seen” of Nick Spaling. At first glance, he’s a tad lanky and almost looked uncomfortable. But he made it known not to mistake that for how calm he is with the puck. Each carry into the zone, he was pretty unpredictable to the goaltenders. He maintained control and gave off no hints as to a shot or a pass. Spaling will definitely see some time on the PK unit if his time in Nashville has an impression and anything, and maybe get a few scoring chances with Marcel Goc or even Brandon Sutter from time to time. Keep in mind, he did play with Hornqvist with the Nashville Predators, and their styles of aggressive net front play are very similar. If the Penguins are trying to stress keeping someone around the paint on all four lines, Spaling will definitely play a part in that. If Spaling and Goc bring the scoring to the fourth line, Blake Comeau will be the worker bee. Comeau was a part of last year’s Columbus Blue Jackets team that frustrated the Penguins through a six game playoff series. Spending the majority of his time playing with Mark Letestu and Derek Mackenzie, frustrating is the name of his game. Despite not scoring any points in that series, and only 16 total last season, he took the ice at camp like he was hungry for some goals. You’ll find more highlights of him in a scrum than celebrating a goal, but he has a solid wrist shot that could make the fourth line even more of a threat. I’m no stranger to the baffled look and confusion that comes with Daniel Carcillo arriving to your roster. Coming from Chicago, I was skeptical to see him signed to the Chicago Blackhawks. But after a few weeks, Carcillo proved he isn’t just another enforcer, he’s a hockey player too. Need proof? Here you go. That’s the same Dan Carcillo that showed up to camp. He snuck into the slot to net one of the first goals of the afternoon drills. He cut across mid pass to try and tap one in soon after. There’s no doubt he has the skills to take on two roles much like Steve Downie. However, putting Carcillo into the mix creates somewhat of a logjam for the bottom six. But after the last few seasons, it seems like a good problem to have. Thomas Greiss was a quiet signing, but the reason was fairly obvious. Greiss is a lot less athletic than Jeff Zatkoff and Tomas Vokoun. He’s very calm and collected and in net. Doesn’t bite on much and that keeps him square and ready for whatever shot is going to come his way. While he did let in more goals than Zatkoff did throughout the day, it’s nothing to read into. What was pegged as a goaltending battle looks more like another day at camp. It’s unfortunate to see Zatkoff possibly losing the backup spot after a great showing last season, but Rutherford will most likely go with the safe bet in Greiss. Don’t count on another Finnish rookie cracking the opening night roster. Kapanen didn’t look like a first round pick on the ice. Focusing on his hands more than his play, Kapanen could still be shaking some NHL jitters failing to receive some pretty easy passes, but it seems as though time is what he needs most. Time may also be what frees up the perfect spot for him on the roster. With all of the excitement around the players, there is definitely something to be said about their coach. Mike Johnston gets all that he can out of his players during practice. Each drill has a specific purpose and is run at game speed. Neither scrimmage on Saturday was ran as a game, but in :45 situational drills. While some were started with face-offs or against the boards, the majority involved (to no surprise) carrying the puck. It wasn’t until this that you could truly see the new pack mentality of the Pittsburgh Penguins. -Don’t be surprised if a pattern starts to emerge with centers getting only one dedicated winger. Expect the grit to be shuffled around that based on the situation.